Presenting cost structure icon. This is a cost structure icon. This is a one stage process. The stages in this process are cost structure, budget framework, fun model. Presenting cost model icon ppt slide. This is a cost model icon ppt slide. This is a one stage process. The stages in this process are cost model, cost framework, price structure. Presenting euro currency symbols medals ppt icons graphics. This Power Point template icons slide has been crafted with graphic of euro currency symbol and finance icons. This icon PPT contains the concept of financial management. Use this icon PPT for business and finance related presentations. Presenting cost increase icon ppt images. This is a cost increase icon ppt images. This is a four stage process. The stages in this process are cost increase, revenue increase, cost growth. Presenting this set of slides with name - Minimize Cost Risk Experience Facilities Management With Icons. This is a four stage process. The stages in this process are Facilities management, Needs management, Provision Management. Presenting money bag in hand cost structure icon. This is a money bag in hand cost structure icon. This is a one stage process. The stages in this process are cost structure, budget framework, fun model. Presenting cost of quality ppt sample presentations. This is a cost of quality ppt sample presentations. This is a four stage process. The stages in this process are prevention cost, internal failure cost, appraisal cost, external failure cost. Presenting coins stack cost structure icon. This is a coins stack cost structure icon. This is a three stage process. The stages in this process are cost structure, budget framework, fun model. Presenting maintain productivity and control costs ppt icon. This is a maintain productivity and control costs ppt icon. This is a four stage process. The stages in this process are control costs, value creation, quality assurance, maintain productivity. Presenting this set of slides with name - Saving Cost Control Icon. This is a four stage process. The stages in this process are Cost Saving Icon, Expenses Saving Icon, Cost Reduction Icon. Presenting cost model icon infographic. This is a cost model icon infographic. This is a one stage process. The stages in this process are cost model, cost framework, price structure. Presenting 6 time quality cost icon powerpoint templates. This is a 6 time quality cost icon powerpoint templates. This is a six stage process. The stages in this process are . Presenting 7 time quality cost icon powerpoint graphics. This is a 7 time quality cost icon powerpoint graphics. This is a seven stage process. The stages in this process are . Presenting this set of slides with name - Cost Benefit Analysis Icon. This is a four stage process. The stages in this process are Cost Benefit Analysis, Cost Benefit Investigation, Cost Benefit Examination. Presenting this set of slides with name - Piggy Bank Cost Saving Icon. This is a four stage process. The stages in this process are Cost Saving Icon, Expenses Saving Icon, Cost Reduction Icon. Presenting cost model icon ppt design. This is a cost model icon ppt design. This is a four stage process. The stages in this process are cost model, cost framework, price structure. Presenting cost increase icon powerpoint images. This is a cost increase icon powerpoint images. This is a four stage process. The stages in this process are cost increase, revenue increase, cost growth. Presenting cost increase icon powerpoint slides. This is a cost increase icon powerpoint slides. This is a seven stage process. The stages in this process are cost increase, revenue increase, cost growth. Presenting cost increase icon ppt diagrams. This is a cost increase icon ppt diagrams. This is a five stage process. The stages in this process are cost increase, revenue increase, cost growth. Presenting cost increase icon ppt ideas. This is a cost increase icon ppt ideas. This is a six stage process. The stages in this process are cost increase, revenue increase, cost growth. Presenting cost increase icon ppt infographics. This is a cost increase icon ppt infographics. This is a seven stage process. The stages in this process are cost increase, revenue increase, cost growth. Presenting production costs ppt icon. This is a production costs ppt icon. This is a two stage process. The stages in this process are january, february, march, april, may. Presenting 3 time quality cost icon example of ppt. This is a 3 time quality cost icon example of ppt. This is a three stage process. The stages in this process are . Presenting 4 time quality cost icon sample of ppt. This is a 4 time quality cost icon sample of ppt. This is a four stage process. The stages in this process are . Presenting 5 time quality cost icon good ppt example. This is a 5 time quality cost icon good ppt example. This is a five stage process. The stages in this process are . Presenting this set of slides with name - Hand Covering Money Cost Saving Icon. This is a four stage process. The stages in this process are Cost Saving Icon, Expenses Saving Icon, Cost Reduction Icon. Presenting this set of slides with name - Money Above Hand Cost Saving Icon. This is a four stage process. The stages in this process are Cost Saving Icon, Expenses Saving Icon, Cost Reduction Icon. Presenting this set of slides with name - Money Grabbed In Hand Cost Saving Icon. This is a four stage process. The stages in this process are Cost Saving Icon, Expenses Saving Icon, Cost Reduction Icon. Presenting cost increase icon example of ppt. This is a cost increase icon example of ppt. This is a three stage process. The stages in this process are cost increase, revenue increase, cost growth. Presenting cost increase icon ppt design templates. This is a cost increase icon ppt design templates. This is a three stage process. The stages in this process are cost increase, revenue increase, cost growth. Presenting cost increase icon sample of ppt. This is a cost increase icon sample of ppt. This is a five stage process. The stages in this process are cost increase, revenue increase, cost growth. Presenting cost saving icon coin falling piggy bank. This is a cost saving icon coin falling piggy bank. This is a three stage process. The stages in this process are cost saving, cost cutting, reduce expenses. Presenting cost saving icon hand with three coins. This is a cost saving icon hand with three coins. This is a three stage process. The stages in this process are cost saving, cost cutting, reduce expenses. Presenting cost saving icon nine coins placed together. This is a cost saving icon nine coins placed together. This is a two stage process. The stages in this process are cost saving, cost cutting, reduce expenses. Presenting time quality cost 3 icon powerpoint slide. This is a time quality cost 3 icon powerpoint slide. This is a three stage process. The stages in this process are project management triangle, time, quality, cost, triangle. Presenting dollar coin with hand cost structure icon. This is a dollar coin with hand cost structure icon. This is a one stage process. The stages in this process are cost structure, budget framework, fun model. Presenting three options business quality cost with icons. This is a three options business quality cost with icons. This is a three stage process. The stages in this process are business quality, quality management, quality assurance. Presenting this set of slides with name - Cost Efficiency Icons Powerpoint Presentation Templates. This is a three stage process. The stages in this process are Cost Efficiency, Cost Organization, Cost Planning. Presenting this set of slides with name - Cost Benefit Analysis Icon Ppt Example. This is a three stage process. The stages in this process are Cost Benefit Analysis, Cost Benefit Investigation, Cost Benefit Examination. Presenting cost structure partner cost fixed cost operational infrastructure with icon. This is a cost structure partner cost fixed cost operational infrastructure with icon. This is a six stage process. The stages in this process are cost structure, budget framework, fun model. Presenting this set of slides with name - Process Maintenance Control Cost Optimization With Icons. This is a four stage process. The stages in this process are Cost Optimization, Cost Reduction, Cost Cutting. Presenting cost saving icon three coins and dollar sign. This is a cost saving icon three coins and dollar sign. This is a four stage process. The stages in this process are cost saving, cost cutting, reduce expenses. Presenting cost saving icon two coins rows dollar sign circle. This is a cost saving icon two coins rows dollar sign circle. This is a three stage process. The stages in this process are cost saving, cost cutting, reduce expenses. Presenting time quality cost 4 icon powerpoint slide clipart. This is a time quality cost 4 icon powerpoint slide clipart. This is a four stage process. The stages in this process are project management triangle, time, quality, cost, triangle. Presenting time quality cost 5 icon powerpoint slide deck. This is a time quality cost 5 icon powerpoint slide deck. This is a five stage process. The stages in this process are project management triangle, time, quality, cost, triangle. Presenting time quality cost 6 icon powerpoint slide designs. This is a time quality cost 6 icon powerpoint slide designs. This is a six stage process. The stages in this process are project management triangle, time, quality, cost, triangle. Presenting time quality cost 7 icon powerpoint slide ideas. This is a time quality cost 7 icon powerpoint slide ideas. This is a seven stage process. The stages in this process are project management triangle, time, quality, cost, triangle. Presenting this set of slides with name - Cost Optimization Icon With Dollar Sign And Gear. This is a three stage process. The stages in this process are Cost Optimization, Cost Reduction, Cost Cutting. Presenting this set of slides with name - Cost Optimization Icon With Funnel And Dollar Sign. This is a two stage process. The stages in this process are Cost Optimization, Cost Reduction, Cost Cutting. Presenting this set of slides with name - Cost Optimization Icon With Gear And Coins With Dollar Sign. This is a two stage process. The stages in this process are Cost Optimization, Cost Reduction, Cost Cutting. Presenting cost saving icon piggy bank coin with dollar sign ppt. This is a cost saving icon piggy bank coin with dollar sign ppt. This is a three stage process. The stages in this process are cost saving, cost cutting, reduce expenses. Presenting this set of slides with name - Cost Management Icon Showing Dollar Sign With 4 Options. This is a four stage process. The stages in this process are Cost Management, Budget Framework, Fund Model. Presenting this set of slides with name - Cost Management Icon Showing Dollar Sign With Bar Graph. This is a three stage process. The stages in this process are Cost Management, Budget Framework, Fund Model. Presenting this set of slides with name - Cost Management Icon Showing Hand With Dollar Signs. This is a two stage process. The stages in this process are Cost Management, Budget Framework, Fund Model. Presenting acquisition cost per customer ppt icon. This is a acquisition cost per customer ppt icon. This is a three stage process. The stages in this process are rising, steady, falling . Presenting this set of slides with name - Cost Benefit Analysis Ppt Icon Show. This is a three stage process. The stages in this process are Cost Categories, Benefit Categories, Cost, Benefit, Description. Presenting this set of slides with name - Time Quality Cost Triangular Ribbons With Icons. This is a three stage process. The stages in this process are Time, Quality Cost, Tqc, Project Management Triangle. Presenting this set of slides with name - Cost Saving Money And Calculator Icon. This is a four stage process. The stages in this process are Cost Saving Icon, Expenses Saving Icon, Cost Reduction Icon. …based costing layout ppt icon. This is a eight stage process. The stages in this process are expenses by department, costs of activities by department, identify activities and activity pools, prepare reports, resource drivers, activity drivers, assign costs to cost objects, costs object costs. Presenting this set of slides with name - Cost Optimization Strategies Icon Showing Gear With Coins. This is a three stage process. The stages in this process are Cost Optimization Strategies, Cost Optimization Planning, Cost Optimization Approach. Presenting this set of slides with name - Cost Saving Money Bag And Calculator Icon. This is a four stage process. The stages in this process are Cost Saving Icon, Expenses Saving Icon, Cost Reduction Icon. Presenting cost analysis in managerial economics ppt icon. This is a cost analysis in managerial economics ppt icon. This is a three stage process. The stages in this process are cost benefit analysis, media tactic, cost, benefit. Presenting cost improvement magnifying glass with growth icon. This is a cost improvement magnifying glass with growth icon. This is a four stage process. The stages in this process are cost improvement, cost reduction, budget improvement. Presenting this set of slides with name - Time Cost Quality Balancing Scale With Icons. This is a three stage process. The stages in this process are Time, Quality Cost, Tqc, Project Management Triangle. Presenting this set of slides with name - Three Arrows With Icons Time Quality Cost. This is a three stage process. The stages in this process are Time, Quality Cost, Tqc, Project Management Triangle. Presenting this set of slides with name - Delivery Business Model Process Cost Optimization With Icons. This is a three stage process. The stages in this process are Cost Optimization, Cost Reduction, Cost Cutting. Presenting this set of slides with name - Rate Modifications Improvement Inventory Cost Optimization With Icons. This is a five stage process. The stages in this process are Cost Optimization, Cost Reduction, Cost Cutting. Presenting this set of slides with name - Product Purchasing Cost Design Cost Optimization With Arrows And Icons. This is a three stage process. The stages in this process are Cost Optimization, Cost Reduction, Cost Cutting. Presenting this set of slides with name - Digital Business It Cost Optimization Design With Icons. This is a three stage process. The stages in this process are Cost Optimization, Cost Reduction, Cost Cutting. Presenting this set of slides with name - Manage Execute Strategize Cost Optimization With Arrows And Icons. This is a five stage process. The stages in this process are Cost Optimization, Cost Reduction, Cost Cutting. Presenting this set of slides with name - Time Quality Cost Connecting Three Puzzles With Icons. This is a three stage process. The stages in this process are Time, Quality Cost, Tqc, Project Management Triangle. Presenting this set of slides with name - Time Quality Cost Three Overlapping Circles With Icons. This is a three stage process. 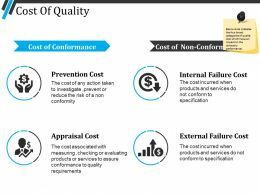 The stages in this process are Time, Quality Cost, Tqc, Project Management Triangle. Presenting this set of slides with name - Cost Involved In Transformation Ppt Powerpoint Presentation Icon Portfolio. This is a two stages process. The stages in this process are Marketing, Business, Management, Planning, Strategy. Presenting this set of slides with name - Performance Resources Drivers Cost Optimization With Converging Arrows And Icons. This is a four stage process. The stages in this process are Cost Optimization, Cost Reduction, Cost Cutting.